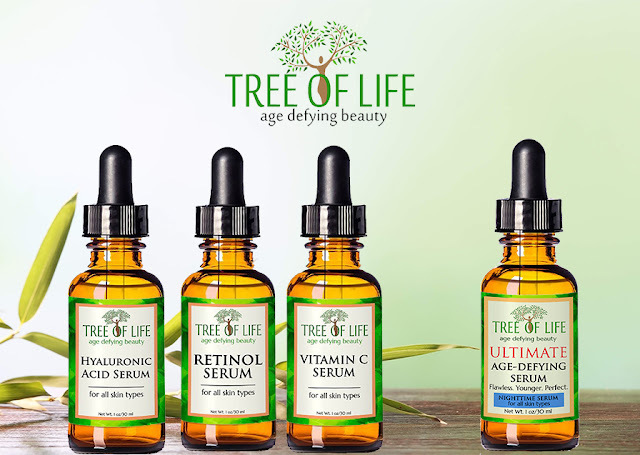 I am so pleased to tell you about Tree of Life Serums, and am thrilled to announce that Tree of Life is generously hosting a GIVEAWAY exclusively for Lola's Secret Beauty Blog readers! If you are seeking effective facial serums that address a variety of concerns, then you will want to read this article! To learn all about Tree of Life, click here. Tree of Life Serum Combo Pack ($29.95 for three 1 oz. bottles from Tree of Life and Tree of Life Amazon Store): This combination pack includes the Tree of Life Vitamin C Serum, Tree of Life Retinol Serum and Tree of Life Hyaluronic Acid Serum. Tree of Life Vitamin C Serum: Vitamin C-based serums are wonderful for brightening skin, gradually fading hyperpigmentation and softening the appearance of fine lines. This serum is feather-weight, fast absorbing and effective at the aforementioned. Furthermore, it possesses no discernible fragrance, and therefore will not pose a problem for people with fragrance sensitivities. Apply to clean skin, and if you use a toner apply this serum after the toner. You will be hard-pressed to find another Vitamin C Serum which combines both organic and natural ingredients in such a way that your face feels smooth and refreshed the moment it touches your skin. Whether your face is already showing signs of aging or whether you are worried it might soon, our Organic ingredients help your skin fight fine lines, dark spots, and wrinkles no matter your age. This Vitamin C Serum cannot be beat. Ingredients Vitamin C Serum: Aqua (Water), Sodium Ascorbyl Phosphate (Vitamin C), Hamamelis Virginiana Water (Witch Hazel), Cassia Angustifolia Seed Polysaccharide (botanical hyaluronic acid), Dimethyl Sulfone (MSM), Tocopheryl Acetate (Vitamin E), Alo e Barbadensis Leaf Extract (Organic Aloe), Ferulic Acid, Glycerin (Kosher, Vegetable), Simondsia Chinensis Oil (Organic Jojoba), Centella Asiatica Extract (Organic Gotu Kola), Equisetum Arvense Extract (Horsetail), Taraxacum Officinale Extract (Dandelion), Geranium Maculatum Extract (Wild Geranium), SD Alcohol 40B, (2s)-2-Amino-5-guanidinopentanoic Acid, Acrylates/C10-30 alkyl acrylate Crosspolymer, Phenoxyethanol, Ethylhexylglycerin. Tree of Life Retinol Serum: This lightweight, fragrance-free, serum sinks into the skin quickly and leaves skin hydrated and soft immediately following application. This serum features 2% Retinol, and may dry your skin a bit– therefore you will want to use a nourishing face cream, and a high SPF sunscreen. I experienced no drying or peeling, but that is not to say that you won't. It does a very effective job in its ability to accelerate skin cell turn over, and reveal luminous skin. With over 700 Clinical Studies showing Retinol's Anti Aging Effects, our Clinical Strength Retinol Serum helps turn back the clock of aging to give you smooth, refreshed skin. Our 72% Organic Retinol Serum helps counter the effects of skin-damage to give your skin a youthful shine while making it feel soft and rejuvenated. Your face will not only feel moisturized and refreshed, but it will look vibrant as our Anti Wrinkle Serum begins to take effect. Suggested Use: Apply daily to clean face, neck and décolleté. If using a toner, apply toner before the serum. Allow time to dry. May be used under makeup. Retinol can dry skin, so follow with a moisturizer. Active Ingredients: 72% ORGANIC | 98% NATURAL | 100% VEGAN | PARABEN FREE > Active Ingredients: 2% Retinol (Vitamin A), Botanical Hyaluronic Acid, Organic Jojoba Oil, Witch Hazel, Organic Green Tea, Vitamin E, and many other natural and organic ingredients. Ingredients Retinol Serum: Aqua (Water), Cassia Angustifolia Seed Polysaccharide (botanical hyaluronic acid), Hamamelis Virginiana Water (Witch Hazel), Glycerin (Kosher, Vegetable), Aloe Barbadensis Leaf Extract (Organic Aloe), Retinol, Triticum Vulgare Germ Oil (Wheat Germ), Simmondsia Chinensis Seed Oil (Organic Jojoba), Tocopheryl Acetate (Vitamin E), Camellia Sinensis Leaf Extract (Organic Green Tea), Resina Propoli Extract (Propolis), Centella Asiatica Extract (Organic Gotu Kola), Equisetum Arvense Extract (Horsetail), Taraxacum Officinale Extract (Dandelion), Geranium Maculatum Extract (Wild Geranium), Hydoxyethyl Ethylcellulose, Carrageenan Gum, Sodium Benzoate, Potassium Sorbate, Ethylhexylglycerin. Tree of Life Hyaluronic Acid Serum: If you have not yet discovered the miraculous benefits from using a Hyaluronic Serum, then this is certainly a great one to try. It is fragrance-free, lightweight and fast absorbing. Hyaluronic Acid radically helps skin retain moisture, but it also serves to plump fine lines and wrinkles. This serum can be used day or night on clean skin. Helps skin retain up to 370% ore moisture than the collagen protein molecule. A well-known wrinkle reducer, Hyaluronic Acid is sometimes known as a "super moisturizer," helping reduce fine lines caused by dehydration. It is perfect for use with both Retinol and Vitamin C, and our 72% Organic mixture contains key moisturizers specifically formulated for use with both other products. Suggested Use: Apply to clean, dry skin daily, or twice a week– depending on your skin type. Follow with moisturizer. Ingredients Hyaluronic Acid Serum: ﻿Aqua (Water), Hamamelis Virginiana Water (Witch Hazel), Cassia Angustifolia Seed Polysaccharide (botanical hyaluronic acid), Glycerin (Kosher, Vegetable), Aloe Barbadensis Leaf Extract (Organic Aloe), Dimethyl Sulfone (MSM), Tocopheryl Acetate (Vitamin E), Sodium Ascorbyl Phosphate (Vitamin C), Simondsia Chinensis Oil (Organic Jojoba), Pelargonium Graveolens Oil (Geranium Essential Oil), Camellia Sinensis Extract (Organic Green Tea), Centella Asiatica Extract (Organic Gotu Kola), Equisetum Arvense Extract (Horsetail), Taraxacum Officinale Extract (Dandelion), Geranium Maculatum Extract (Wild Geranium), Hydoxyethyl Ethylcellulose, Carrageenan Gum, Sodium Benzoate, Potassium Sorbate, Ethylhexylglycerin. Tree of Life Ultimate Serum Nighttime ($24.95 for 1 oz. from Tree of Life and Tree of Life Amazon Store): This is a very active anti-aging nighttime serum that effectively brightens and hydrates the skin, exfoliates dead skin cells, and plumps fine lines and wrinkles. It has a herbal aroma that fades soon after the light weight and fast absorbing serum sinks into the skin. If you are looking for professional, high-end skin-care, you will be hard pressed to find a better anti- aging serum at a more affordable price. Our Ultimate line is packed with some of the strongest ingredients available, and with over 700 CLINICAL STUDIES vouching for some of our main ingredients, we guarantee this facial serum will satisfy you or we will refund your purchase price. With no-holes-barred, levels of Vitamin C, Retinol, and MSM (as well as Hyaluronic Acid, Salicylic Acid, and Niacinamide), this professional anti-aging serum is guaranteed to help your skin look younger and healthier. Ingredients: Aqua (Deinoized Water), Dimethyl Sulfone (MSM), Sodium Ascorbyl Phosphate (Vitamin C), Cassia Angustifolia Seed Extract (botanical hyaluronic acid), Niacinamide (Vitamin B3), Squalane (olive oil based), Rosa Canina Fruit Oil (Organic Rosehip Seed Oil), Salicylic Acid, Melaleuca Alternifolia Leaf Oil (Tea Tree Essential Oil), Lavandula Officinalis Flower Oil (Lavender Essential Oil), Cananga Odorata Flower Oil (Ylang Essential Oil), Retinol, Centella Asiatica Extract (Organic Gotu Kola), Equisetum Arvense Extract (Horsetail), Geranium Maculatum Extract (Wild Geranium), Taraxacum Officinale Extract (Organic Dandelion), Acrylates/C10-30 Alkyl Acrylate Crosspolymer, Sodium Hydroxide, Pentylene Glycol, Polysorbate 20, Alcohol, Lecithin, Phenoxyethanol, Ethylhexylglycerin. Giveaway Details: This truly amazing giveaway is courtesy of Tree of Life and their Public Relations firm. Lola's Secret Beauty Blog will not be mailing the winner their serums, and therefore we are not responsible for distribution. Lola's Secret Beauty Blog is grateful to Tree of Life for offering these 4 Tree of Life Serums to one lucky reader. This is a US ONLY GIVEAWAY, and you must be an email subscriber to Lola's Secret Beauty Blog. Once the winner has been announced, Tree of Life and their PR Firm will send the winner their serums. Follow the instructions found in the giveaway widget below. PLEASE CLICK ON THE TERMS AND CONDITIONS LINK IN THE GIVEAWAY WIDGET for all of the rules governing this giveaway. Best of luck! Overall Assessment: These are wonderful serums, and I can't wait for for one of Lola's Secret Beauty Blog readers to win them. How do these compare with the Reviva products? Hi Cindy, Do you mean Revive or Reviva Labs? I have not compared Tree of Life products to either of the aforementioned brands, but I definitely think that Tree of Life offers high quality and effective serums at an affordable price point. I would definitely recommend entering their giveaway! Sorry, I meant Reviva Labs (that you referred me to a while ago). Thanks! I thought that might have been what you meant, but i didn't want to be presumptuous. I think that you would really be impressed by the Tree of Life Serums! Best of luck! I'm a skincare junkie and these products sound really nice! I really like that they have a trio pack to try a few products out at once. I need to go enter this giveaway! I know you are, Stacie! I definitely think that you would really like these products! Please do enter the giveaway! Best of luck! I love reading about prduct lines I haven't heard of before, and I love the name of this brand... it makes me think fountain of youth, ya know. Definitely something I'll put on my list to check out. I know what you mean, Honey! I love learning about brands that I hadn't heard of either! Please enter for your chance to win! I think that you would really be impressed by their products! You had me at no fragrance. I haven't tried the line but would love to. It actually made me think of you, Marcia! You would definitely approve of their products! Please enter the giveaway! They are, indeed! Yes, their name is fantastic! Please enter for your chance to win, Allison! My pleasure, Lynne! I think that you would be quite impressed by these serums! What a bummer that half of your daughter's Vitamin C Serum spilled! This is definitely a timely giveaway, indeed! Good luck! I hadn't either, and I am so pleased to know about them now! You should definitely enter the giveaway– because I think that you would really love these serums! Oooo! These serums look amazing. I need to look into them, more closely. They really are, Erika! Please make sure to enter the giveaway! This is such a great giveaway for skincare lovers!